Customer service is the provision of service to you before, during and after a purchase. At Totally Basements our company is designed around customer satisfaction. We work hard to specifically enhance your level of satisfaction. In short, we strive to make sure that our service has met your expectations. Our Pledge : To provide a stress free experience for each and every one of our clients by providing superior service along with high quality work. Many finished basements include a Kitchenette consisting of a sink, cabinets, either granite or some other product for counter tops and a refrigerator. 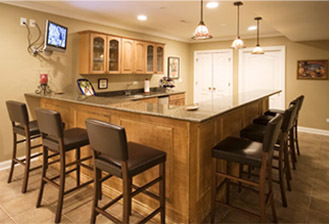 Basement remodeling projects seeking to add a full kitchen need specific approval by your local municipality. 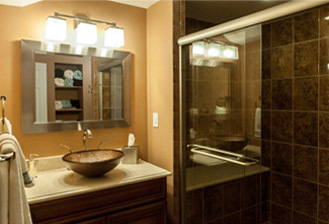 Totally Basements has completed 100's of basement remodeling projects with various types of baths including half baths, 3/4 (with a standing shower) and full baths. We can show you various layouts during our onsite basement finishing visit. 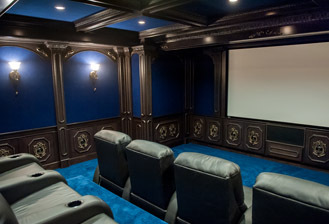 Home theaters are a popular choice as part of your finished basement. Totally Basement can create any type of home theater room you desire. We partner with All Wired Technologies for media equipment and installation.